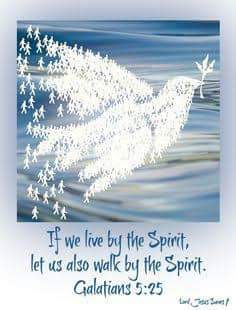 Living and Walking by The Spirit. ​If you cannot overcome sin, how can you overcome Satan? Don’t you know that it is sin that breaks the hedge of Grace that is around you and causes Satan, the serpent to strike you? If you cannot rebuke sin, how can you rebuke Satan? Don’t you know that if the Name of Jesus cannot dethrone sin in your life, it cannot dethrone anything else in your life? Don’t you know that if your faith must move mountain, it must first move you to live an obedient life to GOD? It is to the extent that you have put your flesh “under”, that you have become an overcomer, and YOU ARE NOT A CONQUEROR by merely mouthing off words. YOU MUST CONQUER THE god SELF. Christianity is dying to self. You don’t continue to live in the flesh and be claiming Grace has done it all. If you indulge self, you indulge sin; you indulge Satan. Living a life of sin is inadvertently glorifying Satan. Grace hasn’t come to absorb us of all responsibility, rather Grace is the divine empowerment to live according to the will of GOD. And HE says, “…work out your salvation with fear and trembling for it is GOD who works in you both to will and to do for His good pleasure”. Grace never said, I’ve done it all for you, go and be idle. Grace said,”your sins are forgiven, GO AND SIN NO MORE”. Grace has done a lot for mankind, but the singular most powerful work Grace did on our behalf was to break the hold of sin over our lives, EMPOWERING us to sin no more. Literally we live in order to do just that: To return to our Creator GOD, our freewill. THAT is the purpose and the GOAL of living well. AMEN!